And now for a little Hellcat brush with greatness. 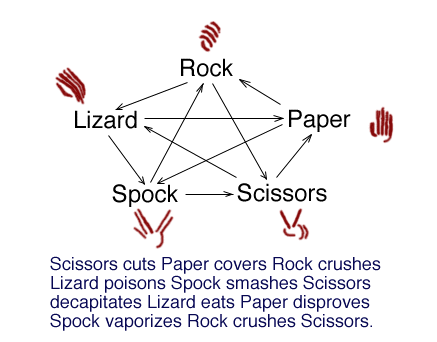 If you’re a fan of the TV show, the Big Bang Theory, then you’re probably aware of the game that they’ve played in a classic episode, Rock, Paper, Scissors, Lizard, Spock. What you might not know however is that the show didn’t come up with the game. They actually found it on the internet. It was invented by my college roommates, Sam Kass and Karen Bryla. Sam and Karen lived with Professor alKhafiz (yes, he’s a real person, err felinoid, too) and I for a year and then they moved out and Max moved in. When the episode initially aired, my friends and I got a nice laugh out of it, since the idea was clearly stolen from Sam’s webpage, but not attributed. Several of us encouraged him to sue the show and make millions as the rightful creator of RPSSL (Sam and Karen say Spock, Lizard instead of Lizard, Spock, though most of my friends say it the same way it’s said on the show). I’m now encouraging everyone to write CBS and demand that Sam be given a cameo on the show as the creator of their favorite hand waving game. And once he does, perhaps he can wear a Hellcats t-shirt and get us some free press. And you know, if the show wants to plug the comic a dozen times or so, I’m certainly not going to complain. Hell, if it comes down to it, and they can only do one or the other, they’re welcome to plug the comic and forget about Sam altogether. I love my friend and all, but you know, these are hard times. Every man for himself! Oh, and if you’d like to support Sam and Karen (they’re married now) and help send their children to college some day, then by all means, order one of their official RPSSL or All Hail Sam Kass t-shirts, available from Cafepress. I SO wish I was smart enough to be a real geek. Geeks are so cool. Do you think if I bought/wore one of those t-shirts I could sort of, kind of fit in?